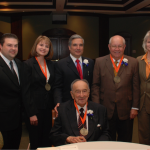 In 2008, a $2 million dollar grant was awarded to the UT Health Science Center to establish an endowment to support an outstanding faculty member and to further the health education initiative at the Laredo Regional Campus. 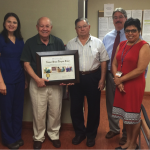 This first Distinguished University Chair for Laredo was named the The Lamar Bruni Vergara Trust Distinguished University Chair in Oral Health in appreciation of The Honorable Solomon Casseb, Jr. and Mr. Joseph C. Martin, III, Trustees. Through this endowment, the UT Health Science Center was able to expand their dental education initiative in Laredo and hire an outstanding faculty member to remain in Laredo and work in partnership with the community and health partners throughout the region. This endowment supports the UT Health Science Center’s mission of providing education and patient care to the South Texas community, in the area of oral health. 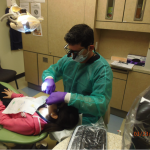 Programs conducted in partnership with the dedicated faculty and staff in Laredo also help provide educational opportunities that will address the dental health professional shortages in South Texas, and help ensure that dental specialty residency training is represented in Laredo. In response to the urgent need for oral healthcare in Webb and surrounding counties, faculty and staff have a successful history of not only providing needed care for patients with low-income, but also for providing training sites for a future oral healthcare workforce for the region. With past support from the Lamar Bruni Vergara Trust, the faculty, pediatric and general dentistry residents, and dental students in the program have provided care for over 20,000 adults and children during 43,711 patient visits since 2009. Last year alone, (FY 15) there were a total of 20,217 procedures provided for children and adults. We are proud to have alumni from our training program working within the region. In addition to the Pediatric Dentistry Residency Program based in Laredo, we continue to coordinate the education, and travel for dental students from the San Antonio campus to rotate to Laredo to receive training and provide care in our clinics. Two-week general dentistry rotations for approximately 45 senior dental students supplemented by a 1 week pediatric dentistry rotation for 90 senior dental students are conducted, and our partners for this project include, the Laredo Medical Center as well as Gateway Community Health Center. These students assist in providing care to patients, as well as providing much needed support to the faculty of each clinic. Support from the Lamar Bruni Vergara Trust made it also possible to expand this program and include training for dental hygiene students, which increased the services offered to patients.